The two most ubiquitous stats for attackers are goals and assists. And why shouldn’t they be? After all, goal differential explains ~85% of the variance in a league table. Creating goals is a very valuable skill. But how repeatable of a skill is it? After scoring 11 goals in his first 19 EPL games for Newcastle United in 2010, Andy Carroll was sold to Liverpool for a staggering 35 million pounds. Carroll would score only six times in his next 44 EPL appearances before he was loaned out and subsequently sold to West Ham. I do not bring up Carroll because I think he was a poor acquisition for Liverpool, I bring him up because he exemplifies the variable nature of goalscoring. When it comes to goals and assists, what is the signal and what is the noise? The original intent of this piece was to test the persistence or repeatability of key passes. To the uninitiated, key passes are passes that directly lead to an attempt on goal. There has been some legitimate criticism of the fact that key passes don’t take proper account of the quality of the chances being created, but for now it’s the metric we have. I looked at every player in the EPL who averaged over 0.7 key passes per 90 in any season from 2009-2013. I then looked at the year over year relationship for key passes: how well do year 1 key passes predict year 2 key passes (n=184)? Quite well, it turns out. 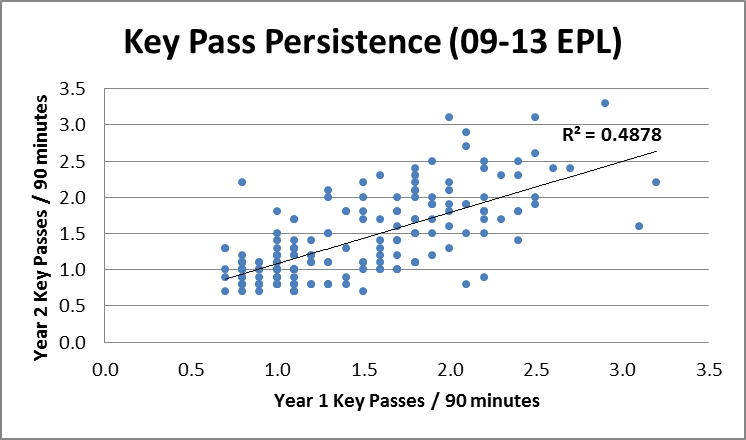 While not overwhelming, the relationship is evidence that key passes are a somewhat repeatable statistic. Next, I took the same sample and looked at how well year 1 assists predicted year 2 assists. There really isn’t a relationship. Assists are basically random from year to year. On a hunch, I looked at how well year 1 key passes predicted year 2 assists. Granted, this is not a great relationship either, but it is significant that key passes actually predict assists better than assists. 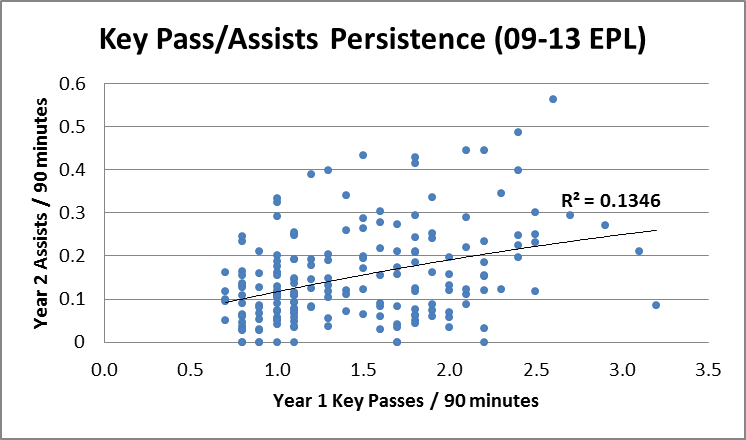 And, unlike assists, key passes have some degree of repeatability. Earlier this year Ben Pugsley undertook a similar study, but he primarily looked at shooting statistics. The statistic with the best predictive relationship? Shots per 90. 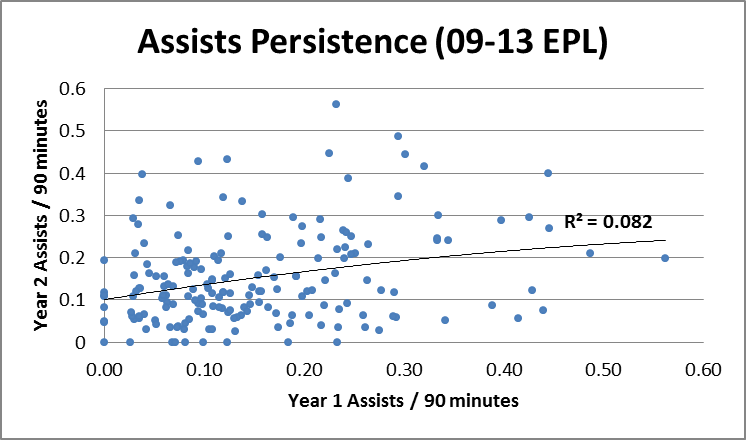 Ben also found no year over year relationship for assists (although his r^2 differed slightly from mine) or goals (below). Ben was kind enough to, as I had done with key passes and assists, run a regression comparing year 1 shots to year 2 goals. 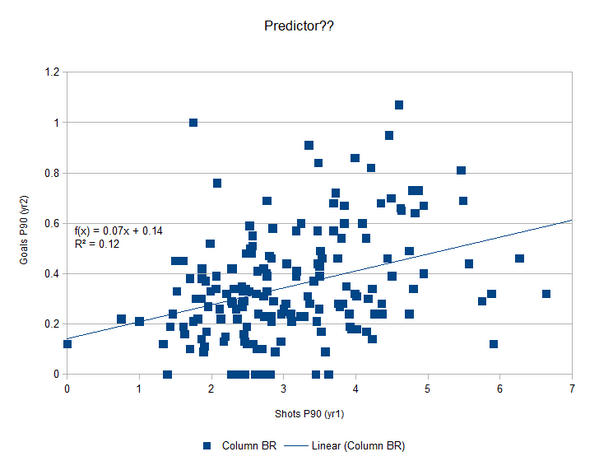 As with key passes and assists, shots predict goals better than goals predict goals. Of course an r^2 of 0.12 is hardly predictive, but at this point in soccer analytics knowing what does not work is just as important as finding out what works. So if goals and assists don’t work, what might? Key passes and shots, taken at their face, are not nearly sophisticated enough. Luckily, much work has been done on shot location/type and expected goals (here and here and many other places). As far as I know, adjusting for shot location/type hasn’t been attempted yet for shots resulting from key passes, but that is a logical next step. Theoretically, an expected goal and expected assist model would be the best predictor. Goals and assists are the unpredictable results of a more repeatable underlying process. By understanding and quantifying this process, we can move towards the signal and away from the noise.